I did not care about showing internet speed on the status bar with an app since I already had an android phone that showed my internet speed on the status bar without any app. But what happened when I lost the phone? I had to find a way to show the internet speed on the status bar since the phone I later got could not perform the task without an app. I’m sharing this in case you would like to show the internet speed on your status bar in your android device which does not have this functionality built in already. In my own case, I can’t really use a phone without the internet speed displaying on the status bar, that will really help me keep track of my data consumption. 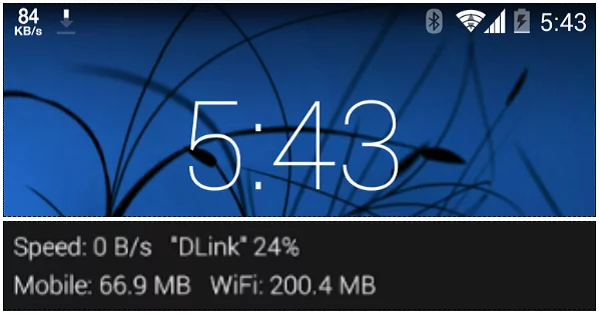 Whatever is the case, I will show you how to show internet speed on status bar with an android app. In my research, I stumbled on some android applications that can show your internet speed on the status bar. But in this post, I will only share with you the one that I consider the best and the one I’m currently using. Internet speed meter lite is the app I’m using on my android app to show internet speed on my phone status bar. The app does not only show your internet speed but will also give you a summary of the data you have been using over a period of time. You can also check your daily data consumption. Even the one that you are using today. This helps you calculate your data balance without checking the balance. From the total data volume that you had, you can judge from the volume you have consumed to know your balance. — Download and install “Internet speed meter lite” and the internet speed will start displaying on your phone status bar without any specific settings. On the application is installed on your phone, no special setting is required for it to start showing the internet speed on your phone status bar. This should only be considered if your phone cannot show internet speed on the status bar without the app. There are phones with this feature built in. In case your phone does not have, download and install “Internet speed meter lite” android app and you will have it displayed on your phone’s status bar.